Last week, Bob and I walked over to Milliken Park to check up on the Trumpeter Swan Cygnets and search for Monarch Butterflies. As we busied ourselves photographing a beautiful Monarch specimen on a milkweed flower, we became distracted by numerous Cedar Waxwings perching in the top of a dead tree. We were happy to see that a number of those birds were still at the park. When I glanced into the crown of a nearby maple tree, I was dumbfounded as to what I was seeing. 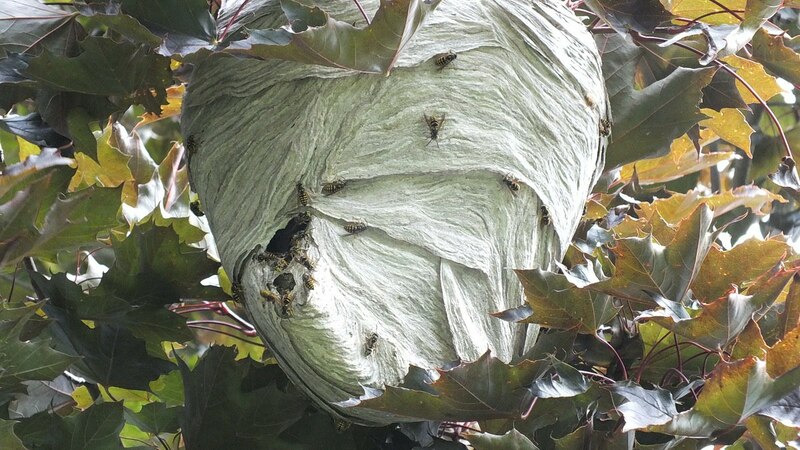 It looked like a huge turban made out of cloth, but then I recognized it as a hornet”s nest. It was huge! 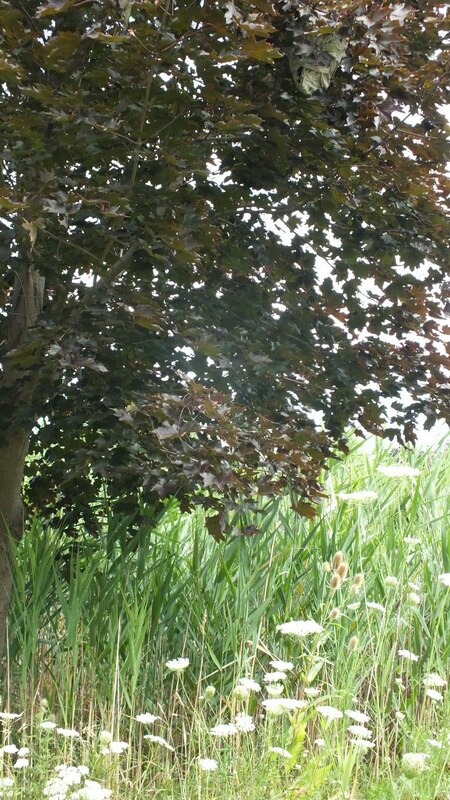 The maple tree was close to the bulrushes that edge the pond. 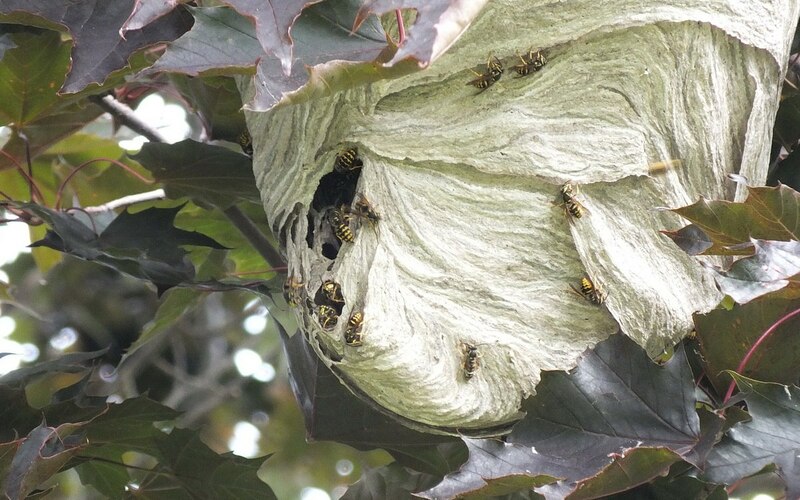 We were able to walk beneath it and look right up into the hornets’ or Yellow-jackets’ nest. It gave me goosebumps to see so many of those potentially pain-inducing wasps in such close proximity, although in most cases, it is only if a person or an animal disturbs the hornets when they are hunting for food or protecting the nest that they are apt to sting. It is only the females that are capable of stinging. These insects are called Sandhills Hornets (Dolichovespula arenaria), but they were formerly known as Aerial Yellow Jacket Wasps. 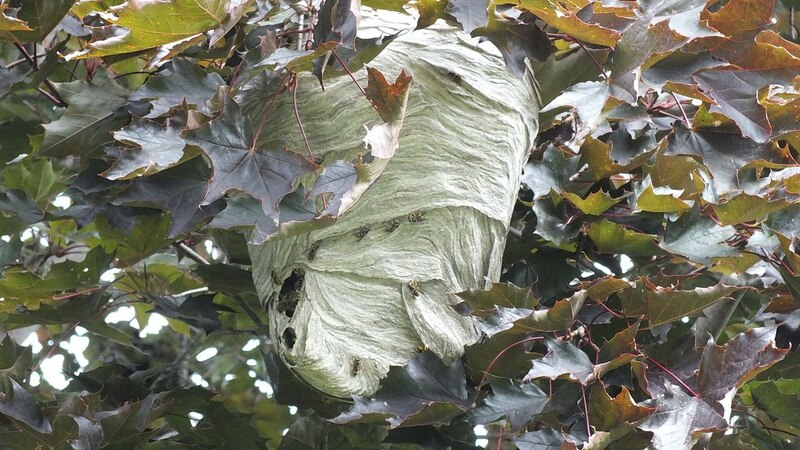 Not all species of Yellow Jacket Wasps build exposed aerial nests, but those that do will suspend their nest from a tree branch, nestle it inside a shrub, or use a man-made structure that provides protection. This is the typical practice of hornets giving rise to the change in classification, but both wasps and hornets are social insects. 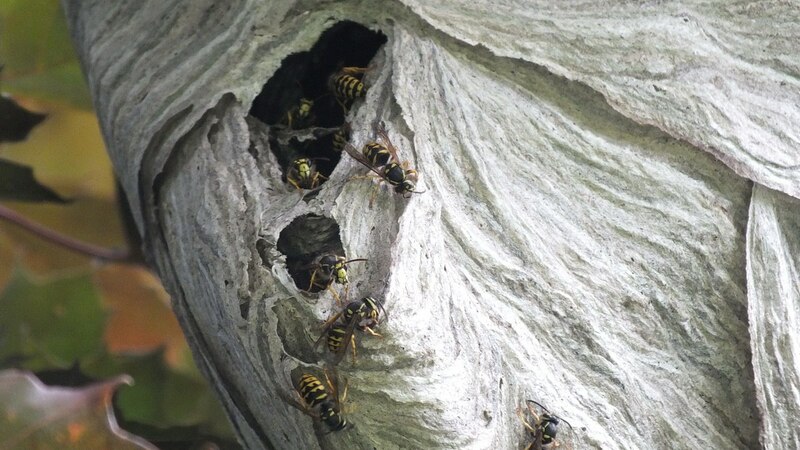 Sandhills Hornets (Aerial Yellow Jacket Wasps) build their nest from wood fibres that they chew to a papery pulp, so it is remarkable that the delicate material can withstand being battered by strong winds and heavy rains over the course of a spring and summer. The honeycomb formation of the cells contributes to the nest’s strength. It is surprising that only one queen Wasp begins construction of a nest in the spring by building just a few cells, and by the end of the summer season, the colony will have expanded into the hundreds. As Bob and I observed the hornets’ nest, there was a constant flurry of activity as workers continued to build the nest. These wasps are almost an inch in length (2.5 cm) and have alternating bands of shiny yellow and black on the abdomen. From one species of wasp to another, the patterns on the abdomens vary making it easier to differentiate between them, and yet all species have yellow or white on their faces. Because wasps are social insects, a colony is comprised of workers, queens and drones (males) that all work together for the general good although each caste has its own special tasks. By the end of the season, all of the hornets will die off except for the latest crop of fertilized females that will overwinter and ready to start new colonies when the warm weather returns once again. 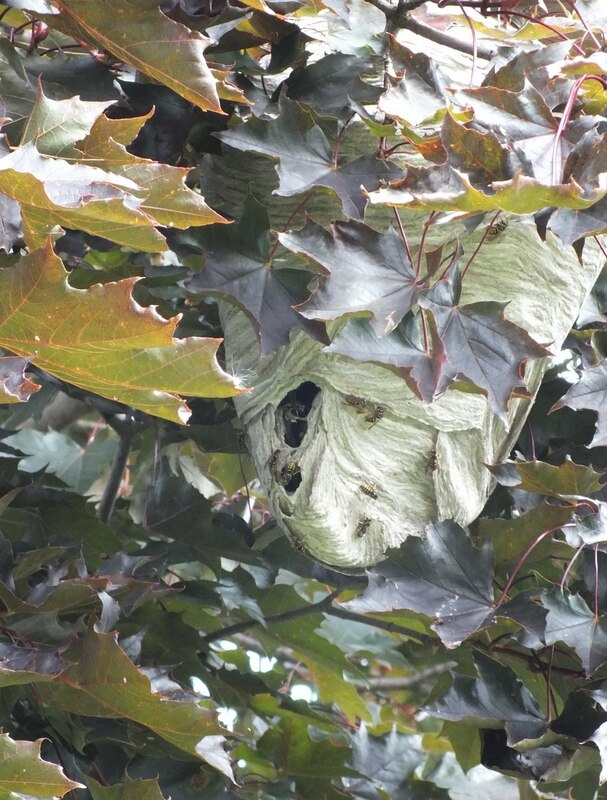 The intricately-constructed nests are not re-used because the ravages of winter weather cause too much destruction. It is common to see abandoned nests lying on the ground or hanging in a semi-demolished state from a leafless tree as autumn wears on. For now, though, this nest at Milliken Park supports a colony that is alive and well. And let’s not forget that hornets do play an important part in nature. They help control insect pests, flies, spiders and harmful caterpillars because that is the food of the developing larvae. I wonder how much bigger the nest will be on our next trip to the park? Already it was a good 16 inches (40 cm) long, enough to make me shiver in my boots.